We're working on the haiku competition: they've been scribed onto little cards, and we're taking the eight finalists out with us on our afternoon picnic to determine the winner. The tension... is... unbearable! In 1986, I was just leaving lower school. I remember a love of playing marbles, collecting Star Wars action figures with my friends, being terrified at the prospect of attending a school filled with Big People, and truly despising tea. I don't get quite so much time with the marbles or action figures these days, and that school now looks rather small and sweet, but my attitude to tea has changed somewhat. While that freckle-faced young boy was facing his new school, this tea was being picked, steamed, and pressed. The timescale of tea can be very sobering. 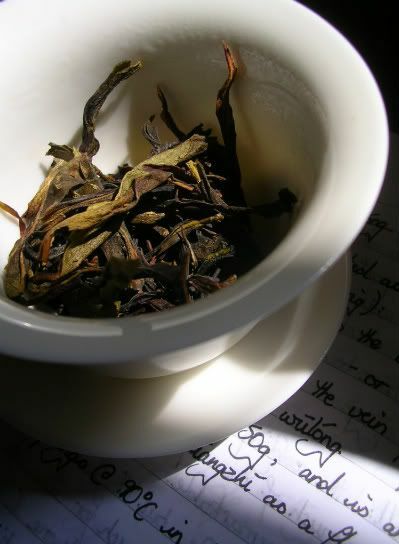 As is common with teas of the old school, the leaves are very small. They have already passed rusty orange, and are descending into the reassuring colour of dark chocolate (shown above, and below). 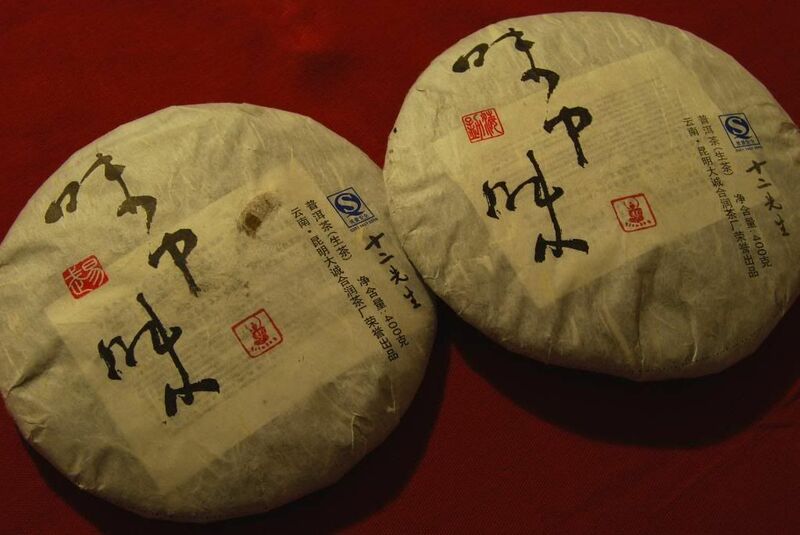 They have a sharp shicang [wet storehouse] aroma, but nothing too recent - this one has been aired for some time. Comme ci, comme ca - I am neither greatly enamoured nor violently opposed to shicang characteristics. 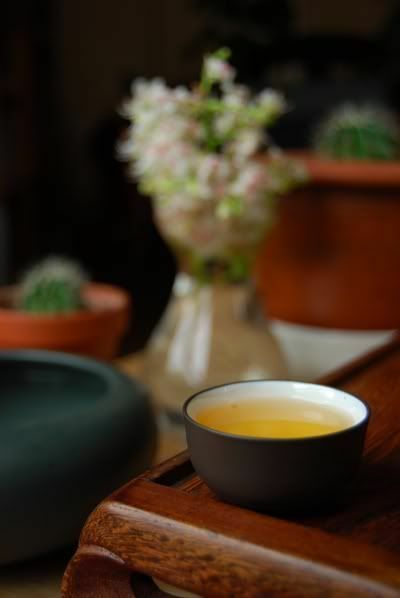 The wenxiangbei [aroma cup] is all sweetness, with great duration. While shicang, it is clean and distinct. The colour of the soup is a highly desirable orange-red. The first sensation is its immediate flavour, a charming and unique character: sweet cedarwood, with a broad, root-vegetable base that reminds me of sweet potato. 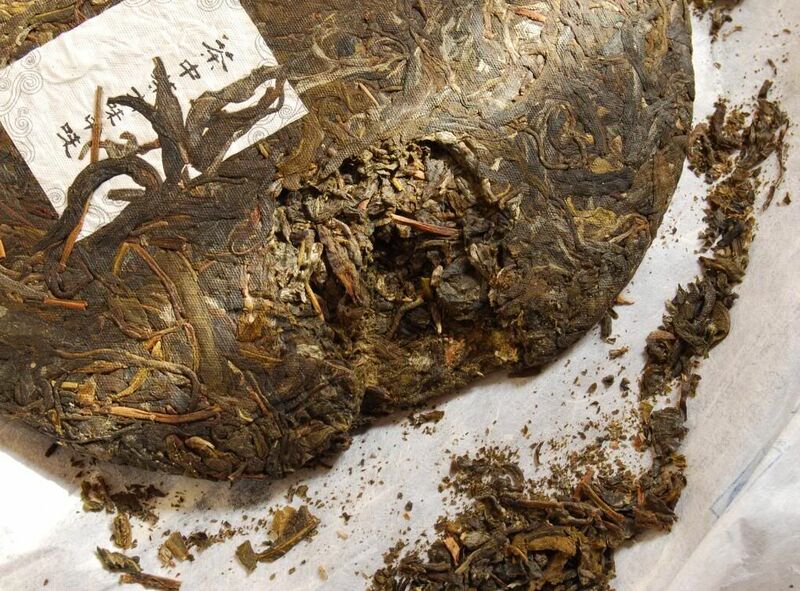 In the nose, a similarly vegetable-like aroma. What a curiousity this is. The huigan pauses before making itself felt, but then resounds in the throat for many minutes. Drinking slowly, this tea is a long event. 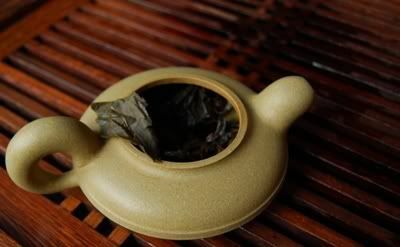 I have used our hanwa [Han dynasty-style ceramic] little 7cl pot, which treats old leaves very well. Its small size requires repeated filling, but more than compensates for our efforts with the joy it brings. Even creamy vanilla notes develop in later stages of this tea, while a gentle chaqi rumbles on regardless of time or potency. The haiku contest appears to have been a hit, a very palpable hit. It being a poetry contest, I was not anticipating a huge turn-out. I am delighted to see that I was wrong! I've sent e-mails to all the entrants that I have received - thanks again for the excellent submissions. Given the surprisingly large number of submissions, and the fact that every entrant will be receiving at least a few samples of tea, I will close entry to the contest by midnight GMT, tonight (Wednesday). If you have some submissions teetering on the edge of being sent, do please send them. I can heartily recommend the holding of such a contest in order to introduce yourself to your readership! Of the 21 entries so far (representing 9% of the current daily readership, according to dear old Google Analytics), only 5 are from readers with whom I have had correspondence in the past. That's 16 new folk that I didn't previously know! I'm very grateful to have had the opportunity to do so, and always encourage e-mails from readers (hobbesoxon at gmail dot com), as blogging is very definitely a two-way process. It makes me wonder... who else is out there?! One of my favourite parts of writing for this site are the community events, and I hadn't realised that it hasn't been since last year that I held one. So let's change that. 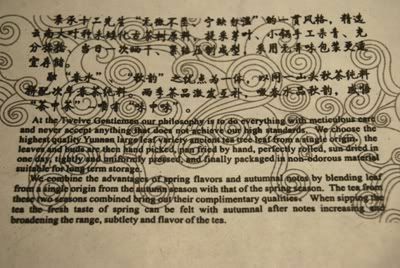 The proprietor of Skip4tea (Patrick) rather unexpectedly sent me a lovely piece of calligraphy, on the theme of tea, seemingly created by an artistic friend. He kindly consented to it being offered as a small prize here - thanks again, Patrick. (I favour the sparsity of pidgin English for translating the sense of oriental languages. 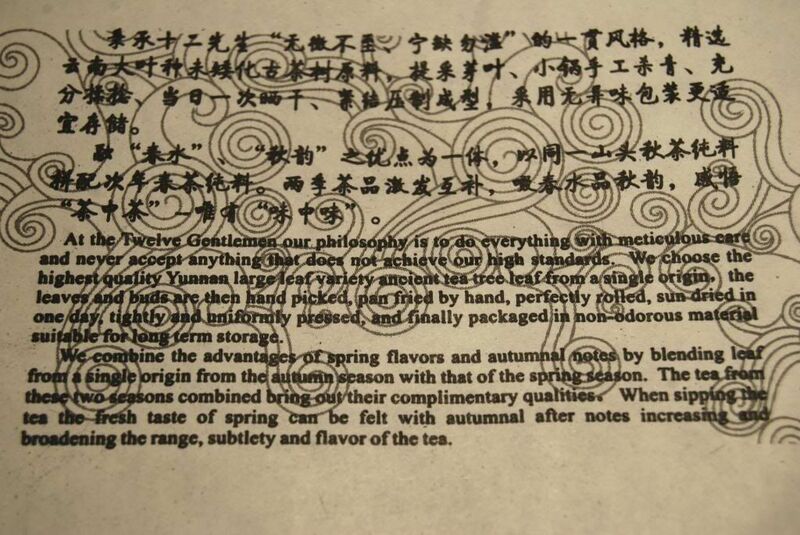 This (rather quite large) piece of calligraphy, with a bunch of samples of teas that I've recently been drinking. The above, without the calligraphy. e-mail me (hobbesoxon at gmail dot com) with a haiku of your own creation. The two that I subjectively enjoy the most will win the prizes. 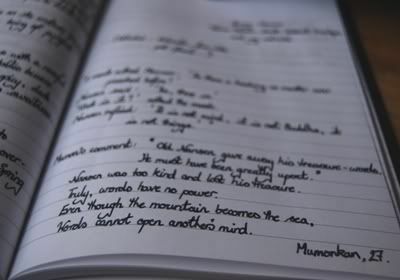 Please put the word "haiku" somewhere in the title, so that I can find it easily. my wife is right - we can't take these lovely haiku without something in return. So, all entrants will receive at least one sample of something enjoyable from recent weeks (probably some 12 Gentlemen tea). 1. The haiku can be either "fixed" format (5-7-5 syllables) or "freeform" format. The fixed-format approach is taught in many schools, to correspond with the 5-7-5 syllables that appear in the original Japanese haiku. However, Japanese sound-syllables (onji) carry less semantic weight than Western equivalents, and so a similar poem might use a smaller number of syllables if written in English, which motivates the more terse "freeform" format. 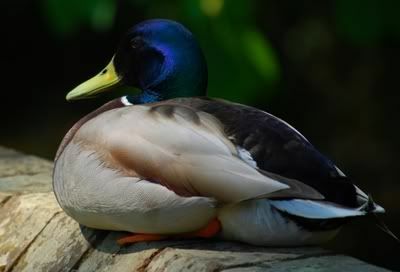 Most of the haiku that you may have seen scattered through this web-site are freeform. 2. You can be as formal or as informal as you wish. There are a bunch of "rules" for creating haiku, which can get complicated (cutting words, seasonal words, etc.). Use these if you like, but you won't be penalised for not using them. 3. 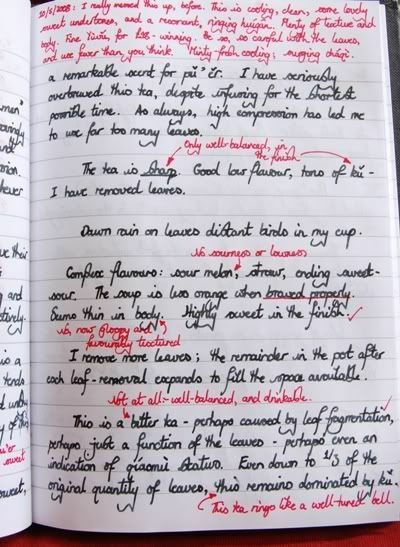 The subject can relate to tea, or not to tea, as you see fit. Don't feel obliged to stick to the theme of tea. 4. You can make a haiga, senryu, tanka, or renga if you wish. 5. All entries could be used to adorn later tea articles on the Half-Dipper! This way, we can all enjoy the fruits of your labour. 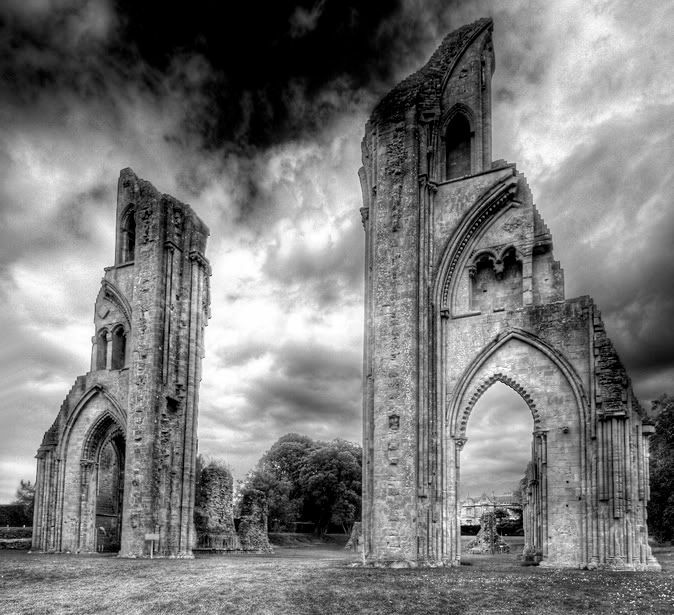 I'll try and match them to a photograph of my own that suits them (example below). If you don't want your initials appearing next to a haiku in a later article, let me know. 6. The closing date will be in around one week's time. ...but I'm never very good at keeping to time. Good luck! I close with a pseudo-haiga courtesy of the photographic genius of VL - please visit his site to enjoy the full range of his talents. 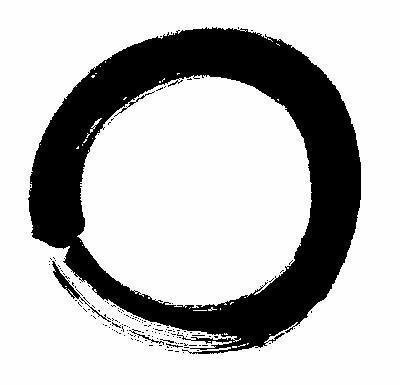 So-called "Zen learning" is something that fascinates me, and it's something that we're all undertaking when we brew tea. 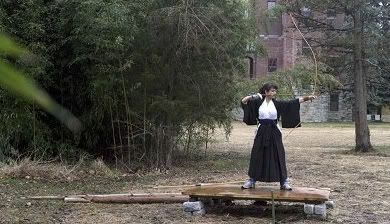 I've twice before mentioned Herrigel's Zen and the Art of Archery, which brought Zen to Europe after World War II. In this short classic, Prof. Herrigel described how he learned archery from one of Japan's masters in the art: day after day, month after month, he repeated the tedious exercise of holding the bow sideways, and then simply drawing and releasing the bow. With no arrows. Draw, release, draw, release. Day after day. After some months, the master commented after one drawing-and-releasing, "There! You had it!" He had observed something transcendent in the manner in which Herrigel released the bow-string, at exactly the right moment, and with exactly the right quality. Herrigel duly tried to repeat the success, with excitement, but met with more familiar failures. His master told him to continue the exercise. Fighting tedium and doubt, more months passed. Every now and again, the master would note a drawing-and-releasing in which he observed that certain quality. Over time, these incidences ("successes") became more frequent. Eventually, Prof. Herrigel became frustrated, "gave up", and yielded entirely to the bow, with the result of obtaining mostly continuous achievement of the right quality. At this stage, his master allowed him to progress to using an arrow - but the arrow would just flop down onto the ground after every release of the bow. This new stage of repetitive exercise was to continue for months, each time the arrow flopping to the ground not far from Herrigel's feet. Eventually, the landing of the arrow in a far-distant target happened as a consequence of continued practice - the successful hitting of the target occurred as a side-effect, with the main exercise being the achievement of the right quality - that fusion of archer and bow in some state far removed from the mind that he initially brought to his practice. 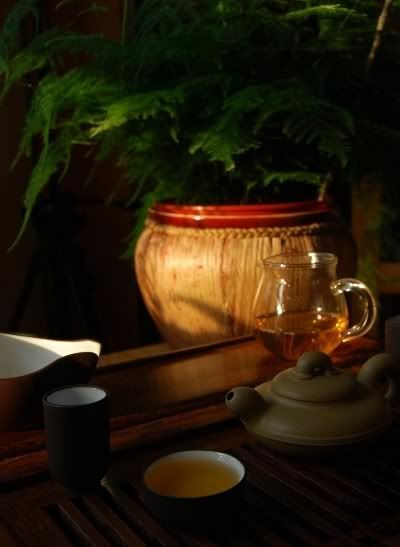 This is Zen learning, and it fascinates me very much, permeating many of the Oriental arts, from archery, to flower-arranging, to martial arts... and, of course, to tea. We brew tea day after day, month after month, year after year - water in, water out, water in, water out. This is practice, of a sort. 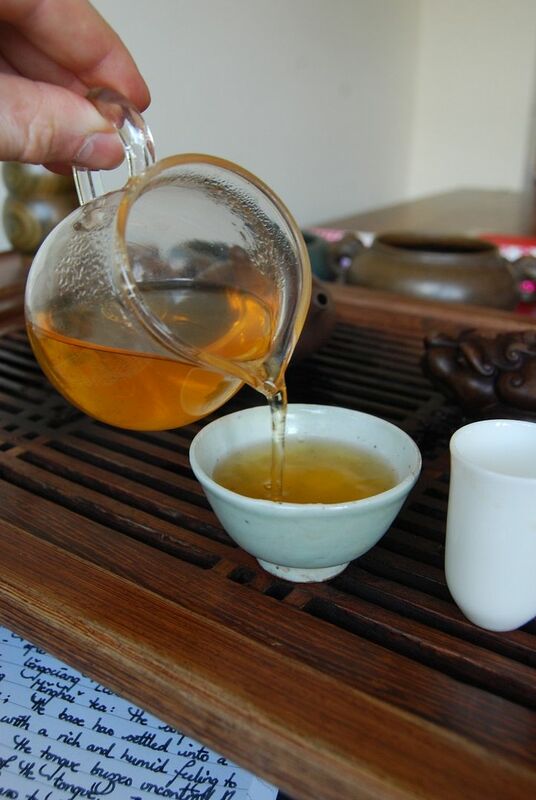 Throughout this practice, something fascinating can be observed: we are learning tea, and its brewing. Up until quite recently, perhaps even as recently as a few months ago, I would count the passing seconds in my mind as the tea infused. I remember writing about this about a year ago. 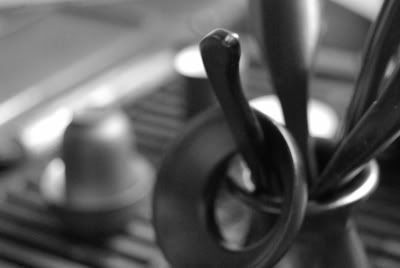 It helped me lengthen the infusion times with each successive brew. Just recently, my dear wife pointed out something to me that I had not noticed: I was no longer counting. I just poured water in, and then poured the water out. Though some infusions came out too strong and some came out too weak, the number of infusions with the right quality were much higher than when I counted breaths. That is, the number of failures had drastically decreased - but they had decreased as a consequence of something having been learned, something that I could not adequately codify or communicate. The tea - just stopped being poorly infused (quite so often). This is not a mystical process, and I am certain occurs in all our daily activities to some extent: the computer programs eventually stop having certain bugs in them; the paint eventually goes onto the canvas in just the right way; the flower arrangements somehow look "right". This is learning the outer form, then the inner form. This got me thinking about taijiquan. 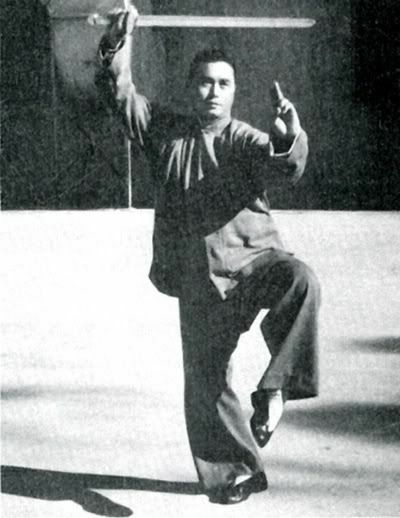 In taijiquan [tai ch'i, the meditative/martial form that one sees being practised in parks at dawn], the beginner initially learns the "outer" form. He learns a sequence of stances, and movements to get from one stance to the next. He learns where to put his weight, where to put his hands, where to fold his hip. Once the outer form is learned, and the outer shape of the sequence of moves becomes unconsciously remembered, he can work on the "inner" form. He can learn where to put his mind, where to place the focus of his attention, where to move the more subtle parts of what the Chinese believe constitutes our physiology. Progress in learning the inner form is immediately obvious in a certain quality of the outer form. That is, the outer form takes on that quality as a consequence of learning the inner form. In tea, we learn the outer form first. 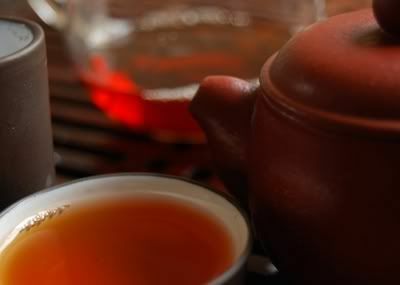 I painstakingly learned the recommended "right" infusion lengths, the "right" vessels for each tea, the "right" amount of leaves to use, all from the words of others, just as if I was learning taijiquan again. 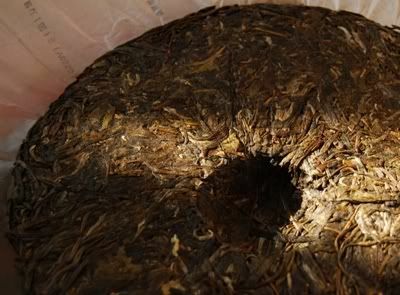 Then, we learn the inner form: brewing tight teas vs. loose teas, brewing dark green leaves vs. rusty orange leaves, brewing heavily aromatic pu'er vs. quietly-scented pu'er. We come to realise that there are no "right" parameters, only suggested outer forms, and we reorganise our own brewing according to our internal experience. We brew, brew, brew, day after day, month after month. Eventually, something clicks, and the tea tastes good on occasion - the quality is good. Maybe this quality comes more often with time, and our intuitive feeling of what any particular tea needs becomes unconsciously more accurate. Eventually, the trappings of the outer form fall away as we no longer require them: the scales to weigh leaves, the timers to time infusions, the thermometers to measure water temperature, even (in my case) the counting of the passing seconds. I'm no master, but it remains fascinating to see progression even in my humble and clumsy approach to tea. It's worth keeping an eye on. i) Skip4tea.com - Wes and Mike have recently ordered cakes which were not packaged too well, and their tea was damaged. I mentioned this while discussing an order of my own, and the company offered to send them both replacement cakes. 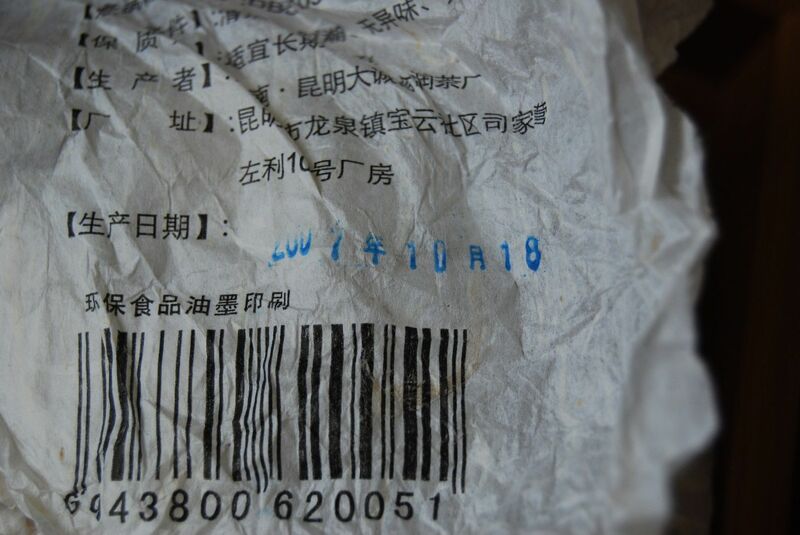 ii) Yunnan Sourcing - an order of mine (some 4-5 cakes + samples) from two months ago has not yet arrived, being five weeks late. On discussing a subsequent order, Scott offered to just include duplicates of the contents of my first order with my second order. Good customer service in both cases, and worthy of commendation, I think you'll agree. I heartily approve of mature business. 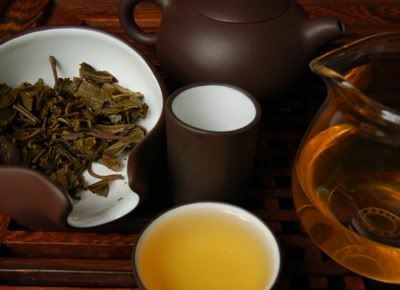 "There are four teas in them, including two aged tieguanyin, one aged baozhong, and one aged Taiwan oolong. 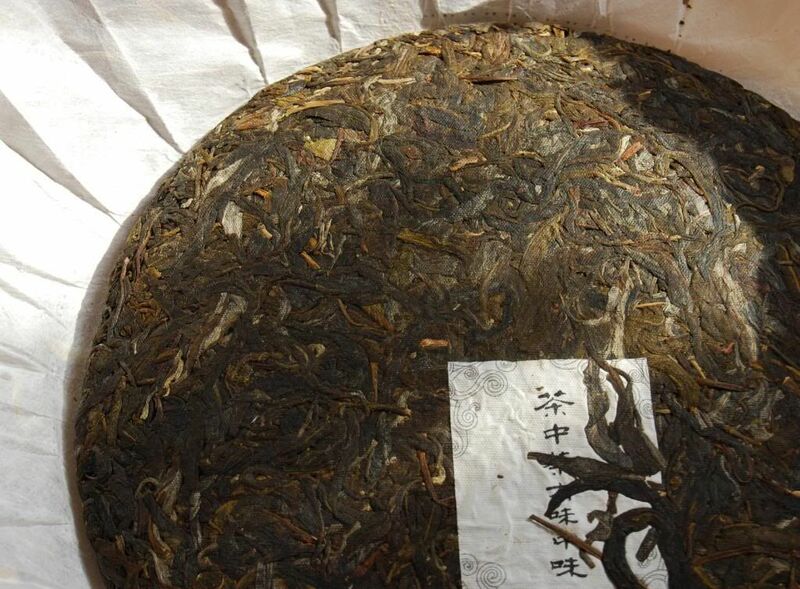 One of them is what is normally passed on in most teashops as "aged oolong", but is in reality probably just a tea that is a few years old with a lot of roasting. I won't tell you which is which (numbered 1-4) unless you want me to." Armed with the knowledge that this requires "good water", I used some of my favourite "Scottish Mountain". The soup (above) is a clean yellow-orange. The first impact of this tea is its scent. My dear wife has talking at length about literary criticism as she approached the tea-table; halfway through a strongly-made point, as she opened the wenxiangbei [aroma cup], and then immediately halted, mid-sentence: "...Oh, nice". The aroma is thick and sweet; similar to a tea that Nada enjoyed with us during his visit, a feeling of definite chaqi is obtained from the aroma alone - something is transmitted in that scent, and collects at the back of the nose, then goes onwards into the body. 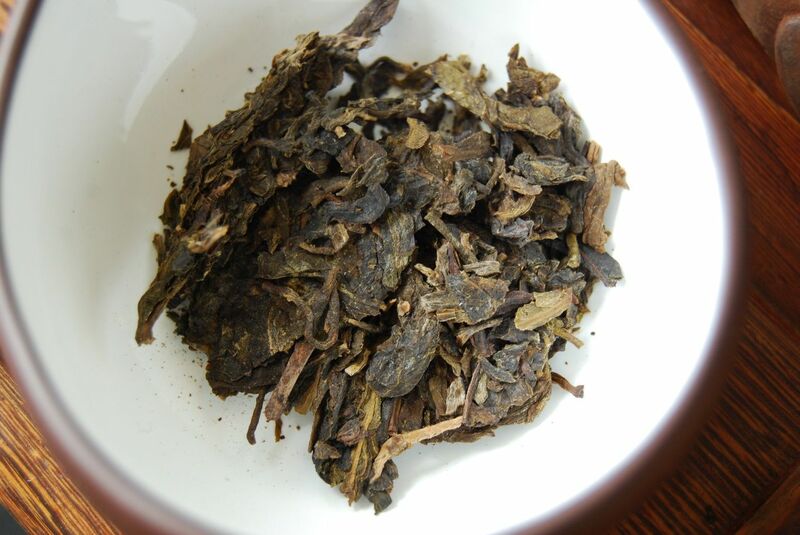 An enjoyable complex of raisin and nuts continues for whole minutes in the narrow opening of the wenxiangbei. 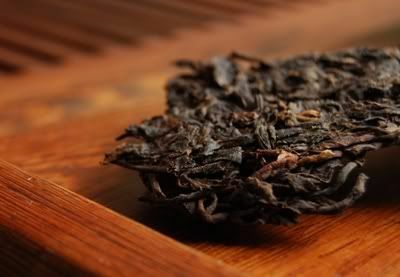 Long and honey-like, with thick texture on the lips, this wulong is the first I have encountered that exhibits the cooling sensation I associate with post-menthol - a sign I always take to mean good leaf, in pu'er. 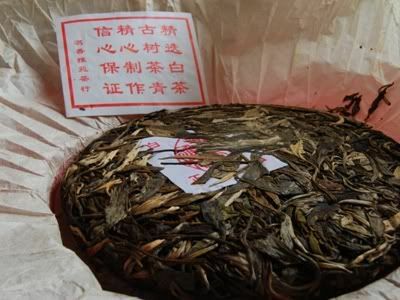 In the tall confines of the wenxiangbei, the roast and wulong scents combine during later infusions to form something akin to the aroma of stem ginger. After the 4th or 5th infusion, the best of the tea is past, but it continues to provide sweet pleasures as long as we provide it the water to do so. This tea is very calming on the stomach. 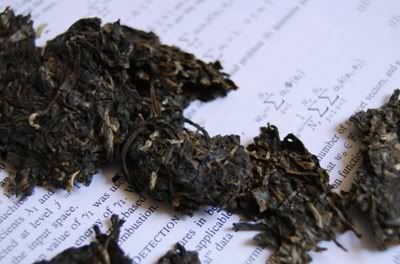 After a spicy meal, and some hours spent bent over my thesis, I had developed a slightly aching tum - this tea banished that sensation entirely. A fine settler, and a tasty session. This is the first Hailanghao bing I have seen "in the flesh", and didn't realise that they were a brand of the Mingxiangyayuan Factory [Famous Fragrant Elegant Garden]. Thanks to Nada for so kindly finding this one. 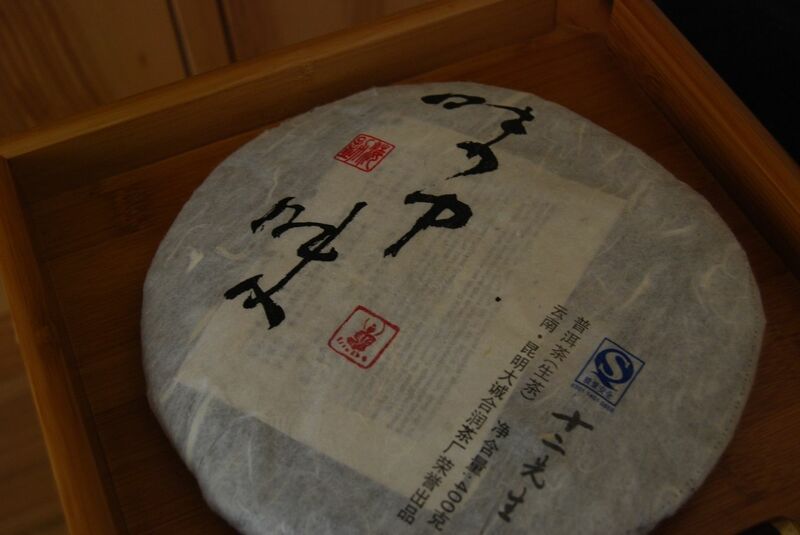 The wrapper tells us (across the centre, in brown characters) that this is gaoshan [high mountain], qiaomu [arbor], dabaicha [big white tea]. 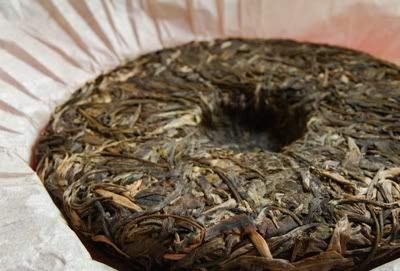 I have little experience with real yinhao [silver-fur] shengpu, save for the 2005 Yinzhen that my dear wife brought back from her trip to Maliandao last year. A priori, it's usually safe to assume that they are pleasant to drink now, but lack the complexity for future joys - and they're typically quite pricey. 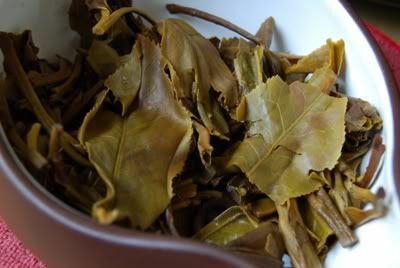 Yangtashan is the mountain in Jinggu from which Dabaicha originates - a typically large-leaf affair, also used in hongcha. This cake does not look like normal yinhao, and that's a very good thing: we have lots of proper leaves mixed in with the (really huge) silver-furred tips. The "da" is "dabaicha" is really well-deserved here. The compression is loose, and the quality of the leaves homogenous throughout. The soup is crystal clear, and coloured a light yellow (as shown below). Unwittingly, I have seriously underbrewed this tea, forgetting that these types of pu'er are usually quite understated. 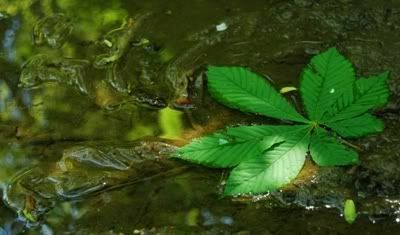 The massive size of the leaves results in almost no sediment. Only habit keeps me using the hulu [gourd filter]. Tasty and sweet, it has the ubiquitous creaminess typical of yinhao tea, with some interest underneath provided by the "real" leaves. Brewing this robustly just brings out a feeling of overbrewed lucha; this is a straightforward tea to be taken at face value. That value is pretty and sweet, and fresh for a morning waking-up session. Thanks again to Nada for a treat into territory that I wouldn't otherwise explore. Please raise your hand if you're familiar with the Mumonkan. One, two, ... not many. Truly, words have no power. Words cannot open another's mind. 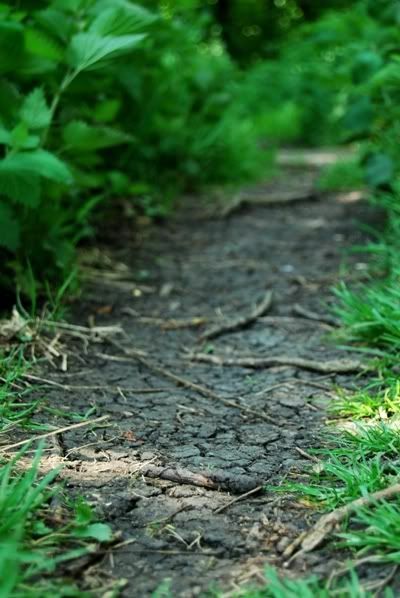 A later conversation with my dear wife led me to relate this to something that I've been quietly observing on the ol' Half-Dipper: you may have noticed the surfeit of words here. There are a lot of them about. Many of them are attempting to record impressions, feelings, instantaneous tastes, aromas, and sensations. Ordinarily, this is fine - I get a record of how various teas affect me, and my assessment of them; you, the eternally patient Reader, get to tolerate this nonsense and provide valuable contributions / corrections where necessary. Most beneficial of all, we get to sit around and talk tea. I've noticed, on occasion, that my humble recommendations have led to a rush on certain teas. While very flattering (it's much more than these notes are worth than to consider them reliable records), I don't want you, Gentle Reader, to be disappointed - and would always recommend testing a tea before buying. My words are just that. I would never claim to be a master (and harbour a secret distrust of anyone that styles themselves thus), but it is said that "I can describe the water to you, but it won't cure your thirst." The only real way to get a solid recommendation is to sample it for yourself - but please do sample it. The thought of someone doing these words the honour of following them without sampling is really infinitely more than they are worth, and surely - my taste will differ from yours, in some way, at some time. I'm always struck when comparing notes with teachums - though I trust their opinions with deep respect, and admire their ability to discern subtle flavours and characteristics that I cannot, we seldom agree. In fact, we tend to disagree more than we agree. With some, this is more prevalent (CB, I'm looking at you here!). 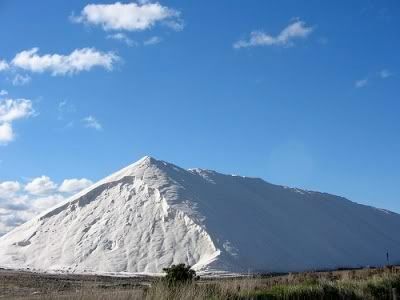 So take all this with a fairly hefty pinch of salt, I implore you. The name of this factory is really the "Zhongguo Yunnan Lincang Qiannian Gucha" Company [China Yunnan Lincang 1000-year ancient-tea], but I'm going to call it "Lincang Tea Co." for now. This cake was very kindly sent from Nada, which he called Sun Tea - I notice that the images around the outside of the cake are leaves with "ST" letters inside them. 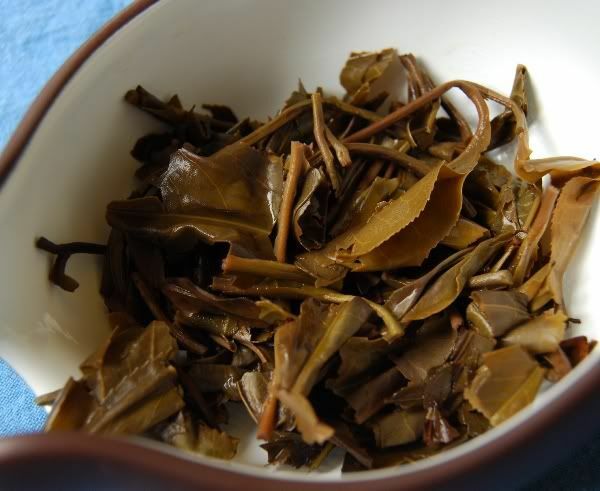 Both inner and outer leaves are dark green, and have a forthright aroma of solid shengpu. Gingerly, I work out some leaves from the inner discus and mix them in with some of the large, loose outer leaves. The soup is dazzling yellow - its clarity thankful indication that I didn't break too many leaves with the knife. 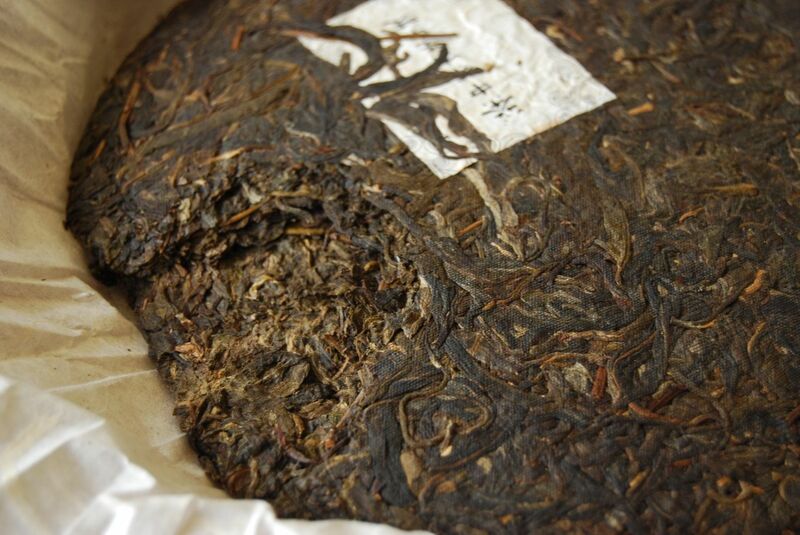 Since recent experiences with the 2007 Shi'er Xiansheng "Yiwu", I am going slowly and carefully with the pu'erdao. 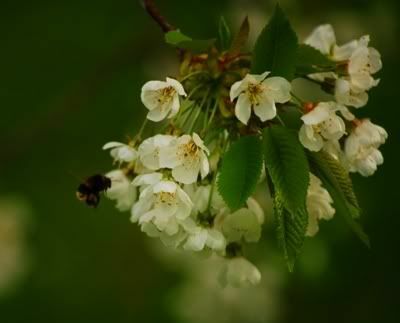 In the wenxiangbei [aroma cup], there is absolutely no beidixiang [initial scent, lit. 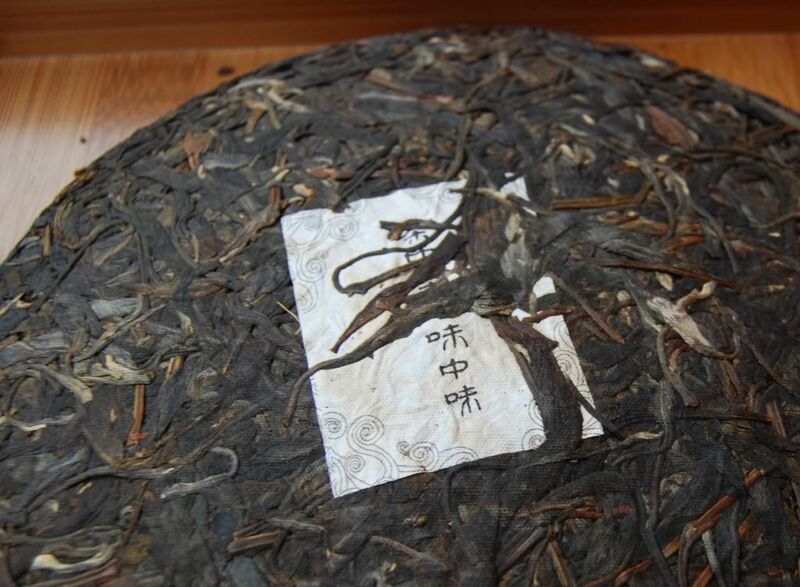 "cup bottom scent"], but an exceedingly long lengxiang [secondary scent, lit. 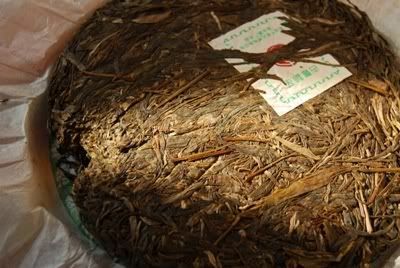 "cool scent"] - this usually leads to a low character of the tea, with some sweetness in the end. 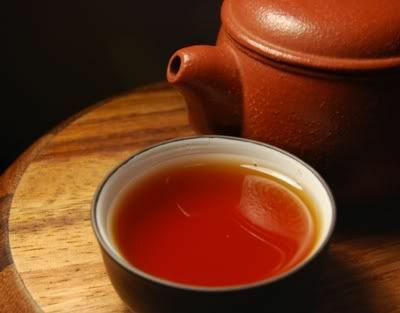 The tea itself is highly appealing: it is low, and slow to open, following the progression in the wenxiangbei, then resounds in an eternal huigan. With thick texture felt heavily on the tongue and a pronounced cooling sensation, it seems that this is quite a mouthful. Bright, reviving chaqi feels significant in my body, and I am left very pleased with this cake. Thanks again to Nada for a lovely session. 2007 12 Xiansheng "Weizhongwei Yiwu"
I'm never too proud to admit a mistake, and my first session with this tea was what is technically known as a "balls-up". Thanks so much to Nada for this cake, pictured left in the above photograph. 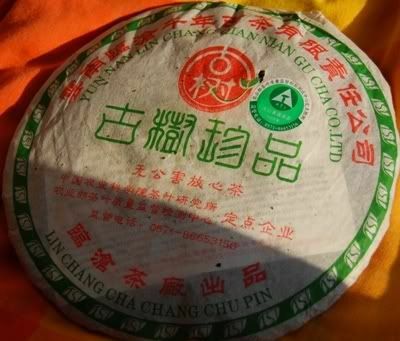 As with its sister cake (the 2007 Shi'er Xiansheng "Weizhongwei Menghai"), this is exceedingly tight in its compression. Therein lies both cause and consequence of my errors with this tea. ...though sometimes I miss the heady bygone days of "the greater mellowness the more time". My first session used clumsy force to break out some chunks of leaves from the tight cake. The result tasted appalling. 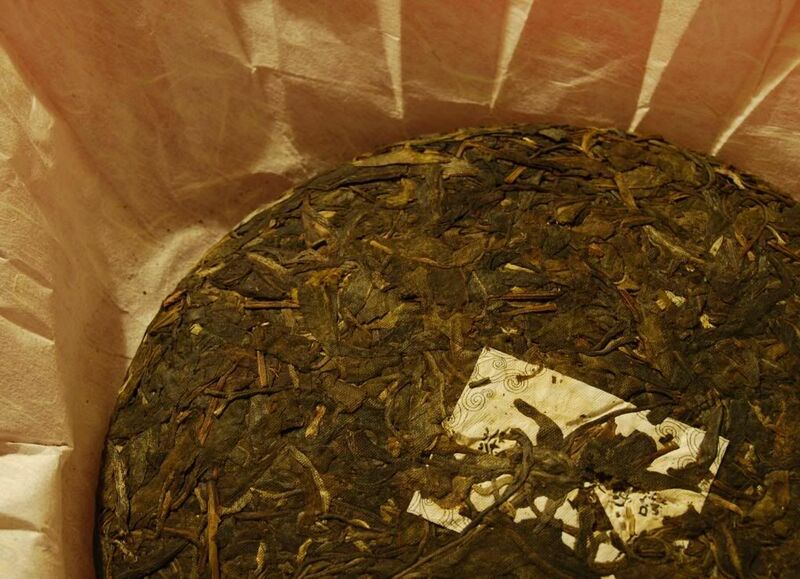 My second session was an attempt to redeem this tea: I was exceedingly careful, slowly working just the tip of the pu'erdao between layers, from all angles, until a small section of leaves could be lifted from the bing. That first session resulted in lots of sediment in the hulu [gourd filter], and a curiously dark orange soup, which was so cloudy that it looked almost milky. The tea was bitter in the extreme. Removing leaves from the pot did not improve matters, and the whole affair was thin in texture, and low on flavour. 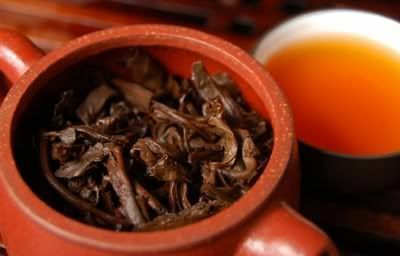 The second session was like a completely different tea: a wonderfully cooling sensation came from the leaves, testifying to their laoshu [old tree] status. 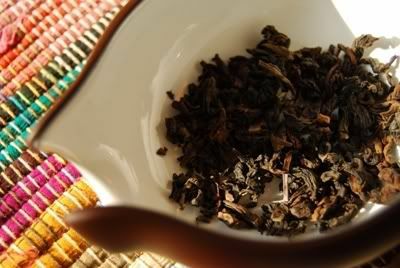 The flavour was a complex blend of charming Yiwu sweetness and rich honey, right from the first infusion. Some ku [bitterness] was present, but only in a well-balanced proportion in the finish, to provoke some serious mouth-watering. The entire second session was a revelation, and I walked away i) relieved; ii) highly enamoured of this fine tea. This was a real education. 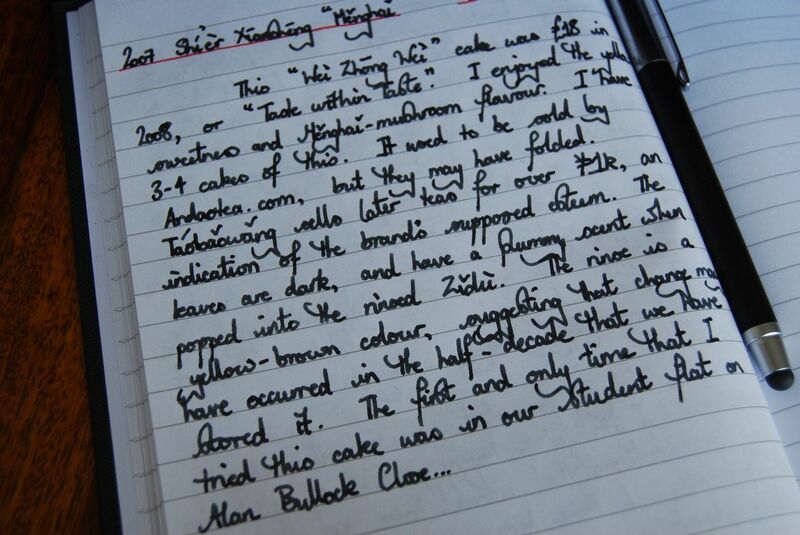 I learned a lot about brewing tea from this cake, or rather, in the effect of leaf-damage on the resultant tea session. It seems that there really can be no saving a session if inadequate care and patience are shown with the knife. This is a tea that has achieved a certain "technical" excellence. Some teas are beautiful in the manner of a rough diamond: a natural ruggedness. 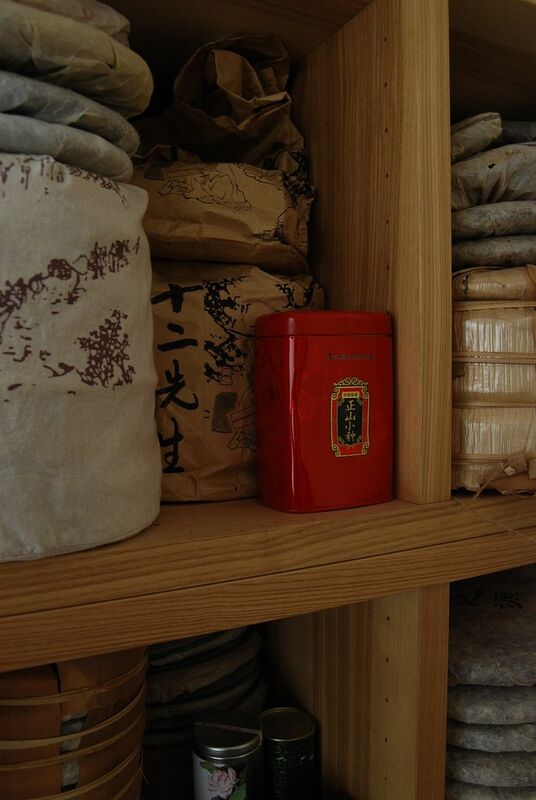 Some teas are beautiful because they are rarefied and elegant. This tea is beautiful in a carefully-maintained and well-constructed fashion, like the careful lines of a pre-Raphaelite. The Shi'er Xiansheng are very much in control of the variables, it would appear, and the result is a technical success that remains thoroughly enjoyable. The whole rings cleanly and true like a well-tuned bell. Great stuff. A third session: I sat down, expecting to be underwhelmed and disappointed, suspecting that my previous enthusiasm for this tea would be dampened. I was greatly surprised by the real enjoyment and obviously high quality of this offering. Complex, stuffed full of character, and long-lasting, this tea really took me by surprise, again. Tasty, tasty, tasty. It's been over a year since I tasted these cakes - after a conversation with GV, who is considering buying some for storage, I thought I'd get reacquainted. The leaves have darkened significantly during the past year, which you might be able to see if you compare the above photograph to the admittedly awful equivalents from last year. Much has changed in the last year - I use a tetsubin-and-hotplate, and tend to leave my water out in a jug the night before a session. Much has also remained the same - I use the same water as a year ago, the same pot, and presumably the same technique. 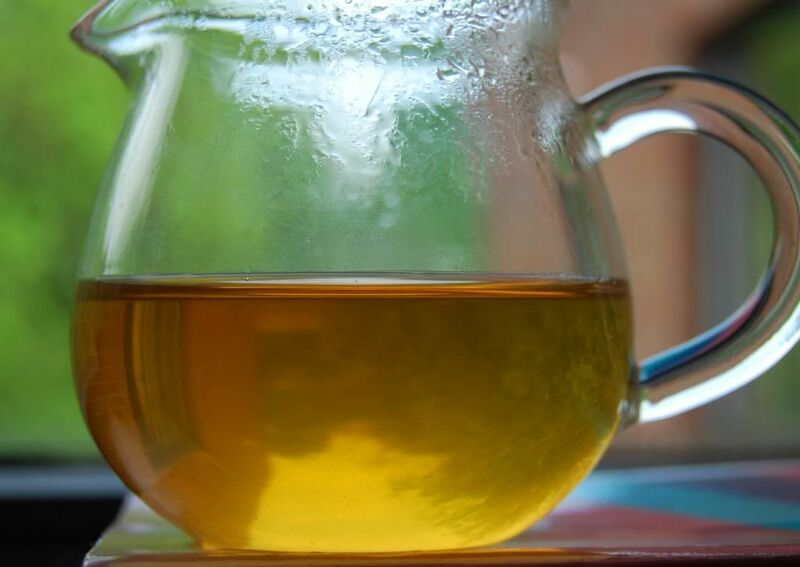 This tea has maintained a strong, creamy, grain-like character that I enjoy very much. 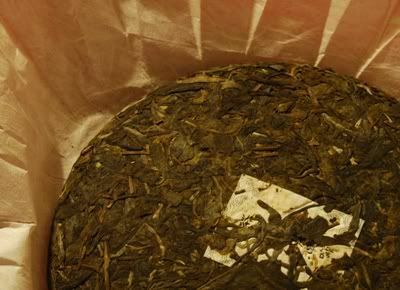 I did not notice it before, but the maocha is a blend of autumn and spring leaves, and this is patently clear in the flavour: it has the bass, rich flavour of autumn combined with zesty, sweet Yiwu springtime. The quality of the leaves is very good. I previously wrote that they had been mulched, Taiwanese/Big Factory-style, but this is not the case. As may be seen above, the majority of the leaves are large fragments, or whole. They are thick and healthy, which is encouraging. I don't believe that I used enough leaf this time around. There was just a hint of plantation roughness in the end session (around the 15th), but the majority were smooth, indicating a decent blend. This absence of roughness should have allowed me to beef up the leaf quantity, but I played it very conservatively because of my initial experiences, written above, in which it came out very bitter. One year later, and I find it to be smooth and flavoursome, and would benefit from using plenty of leaf. It hasn't so much aged, so as much as left its infancy. It's nice to see it getting darker, however. Chachong is a tricky term, which is sometimes translated "tea insects". Chinese being the (poetic / frustrating) language it is, "chong" refers to "little lifeforms". Chachong are the little lifeforms that squat on our tea-trays. Having received a few messages on the subject, I thought maybe an open response is in order. Above is Qingchan, my constant tea companion. When I'm lucky, my dear wife joins me at the tea-table, but our work hours sometimes make this impossible - those times, it's just Qingchan and me, man versus mythical frog creature. 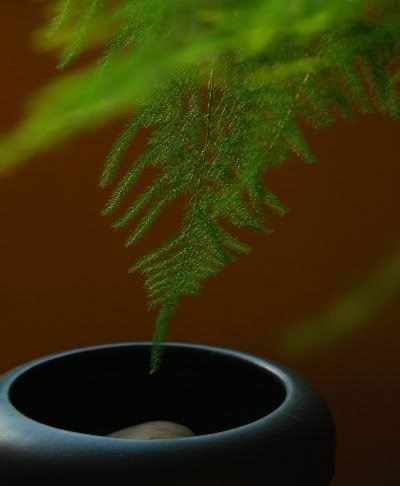 We try to be quite "wabi sabi" in our tea sessions (and in our life generally), which means no extraneous clutter, no junk, nothing that isn't serving a well-worn, well-defined purpose. 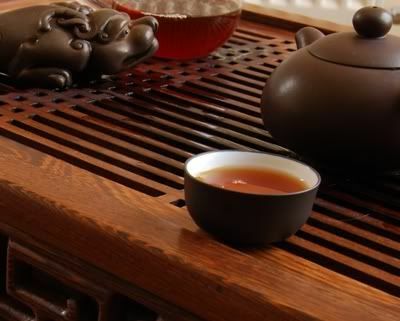 As a general principle, it means "travelling light", but if you saw our tea-table, you might not think it too light, with its flowers, chaxi [water bowl for storing cups], chadao, chahe ["tea lotus" for holding leaves], waste bowl, and a bowl of water with a rock in it. 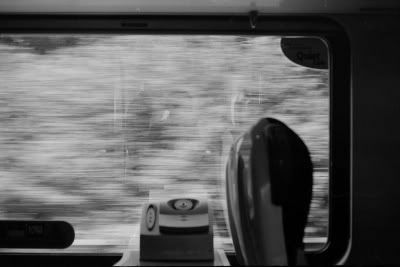 This is the greater sense of "travelling light" - the things we have are loved, used, and moved around, and fulfil some sort of function, even if we are not sure what that function might be. Whatever actual function a bowl of water with a rock in it fulfils, it has some sort of consequence on the atmosphere, and feels "right". That's the crux of it. If it's gathering dust, get rid of it. 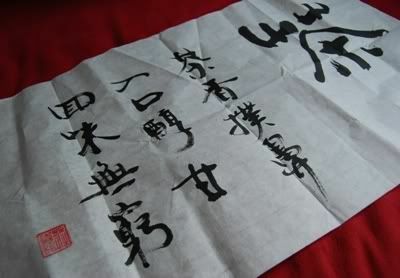 Old and stagnant items are "stale qi", in Chinese terms. Qingchan is made of yixing(-esque?) 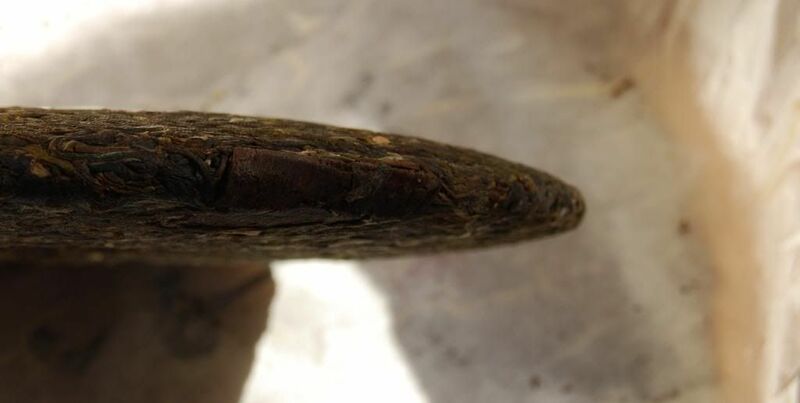 clay, and has accumulated a fine patina, receiving a cup from every gongdaobei of tea that I brew, and a thorough rubbing down with a cloth after the session. Like the bowl of water with the rock in it, Qingchan is beyond function - he gathers no dust, keeps me company when I am otherwise drinking alone, and that's enough for me. Be careful when selecting chachong - it's like picking a puppy. You will have to stare at it many hours, so do not take the purchase lightly. 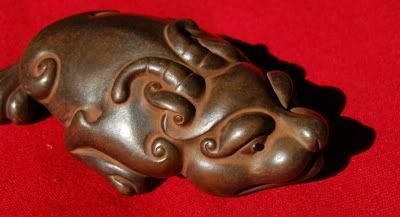 Also, they are needy, like pets: to buy a chachong is to commit to feeding and polishing it. I refuse to buy any more chachong (to do so would be an insult to Qingchan), but I would exhibit extreme caution were I to think about doing so. Teapots are like this. My regular advice is: don't rush into teapots. Before long, you will have thousands. I did this, becoming hopelessly over-enthusiastic, and ending up with pots that were wholly unsuitable, and seldom used. After much soul-searching, we have rid ourselves of many to friends, to our offices, to charity shops, leaving us with the true kernel of awesome, suitable pots, well-fit to our brewing and our personalities. Perhaps one has to walk that same road oneself before reaching the same conclusion, as I blissfully ignored similar advice to buy slowly when I was getting into tea. These days, though we are down to about ten pots (!) for various genres of tea, I find myself using the lovely pot shown in the above photograph for the overwhelming majority of tea sessions. There is an old story of a monk who loved making tea so much that he was buried with his teapot, and I am beginning to feel like this towards my pot. To that end, I recently gave him a name: "Zidu" [zi3 du4 - purple belly]. My dear wife was initially in favour of something more poetic (probably to do with clouds and heavens), but I wanted something more earthy, more Daoist, more gritty, more mundane, more humble. Zidu is my fat little buddy who brews shengpu in his warm, heavy, purple belly. My wife admits to coming around to my way of thinking on the name (a big win). Zidu is about as big as a pot should be, for me, being 12cl (4 fl. oz.). Anything larger than this I have found to be simply too large - even 15cl (5 fl. oz.) is too big, as the pot generally cools too quickly, and is not adequately filled with leaves or water. Zidu's size allows 5-6 cups of the size you see in our photographs - convenient, as we only own six sets of cups, and drinking in a party of more than six becomes "vulgar" (one of my favourite passages from Lin Yutang, don't blame me!). Zidu is also insanely heavy. Despite his small size, he is extraordinarily thick, and his clay is very dense. This means that he retains heat for ages. Verification of clay types is well-nigh impossible, but his sheer density, and the rapidity with which he grows a patina on his exterior skin, inclines me to believe the shopkeeper's claims of "zisha" (aren't they all?). This matters little, of course, being a misleading and unverifiable detail - the importance being the excellence of finish, the density of clay, the retention of temperature. Again, for this reason, I would hesitate before buying pots. Get recommendations from people you trust, or (best of all, if opportunity permits), shop for them yourself in actual stores. The quality of the patina varies between my pots, too. Though Zidu drinks the most tea, his progress in developing a profoundly-rooted shine has been much more rapid than his cousins on our teapot shelf. There is something about the nature of his skin that seems easy to nourish - I am no expert on clays, so cannot guess why this might be, but it is interesting that such a phenomenon is noticed on a pot that is good quality in many other ways, leading me to infer that this may be a sign of good quality in itself. Who knows. To buy pots too small is as painful as buying pots too large - I have a 6cl pot (2 fl. oz.) that we use for very old teas, where the quantity of leaf is necessarily limited, but to brew other teas in a pot so small is to have to refill it every few gulps of tea. This much action from the kettle is not my style, so I tend to stay in the 9-12cl range (3-4 fl. oz.). So, while this article isn't really about Zidu, I hope I've explained some of the more important factors that influence me when buying pots. The bottom line: buy slowly, get recommendations, buy slowly, buy slowly. Small leaves with some tips, this tea appears to be quite dark already, as may be seen above - though in that dark-green way, rather than a proper dark-orange of real age. The aroma of sweet leather about the dry leaves is very appealing; its youth is emphasised by some vague lucha scents. 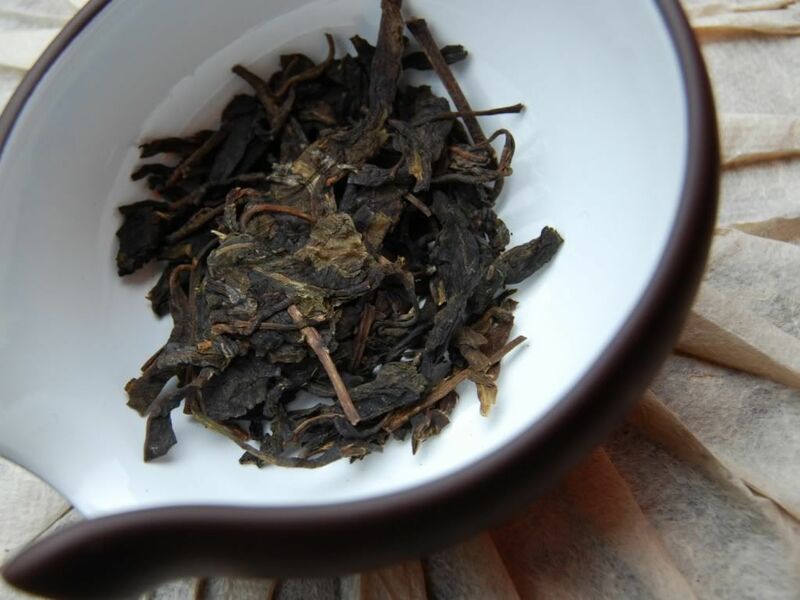 Energetic on the lips, this tea has a low, mushroom character with a simple, sweet finish. As usual, tight bing compression has led me to use too many leaves, so some are removed from the pot and placed in the chahe for later reintroduction. The virtues of this tea are not striking: it is a properly bitter tea, absent any real complexity that would provoke me to buy it. 2007 12 Xiansheng "Weizhongwei Menghai"
These may or may not be the names of the Shi'er Xiansheng [12 Gentlemen], but wouldn't it be nice if they were? During his time in Kunming, Nada has been impressed by the thorough "geekiness" of the 12 Gentlemen with respect to pu'er. I appreciate their simplicity, and their small annual output: I am a big believer that a premium brand can maintain its high quality over a small number of different productions each year, but, once the number of different offerings becomes too large, quality must be sacrificed. The calligraphy on the above wrappers reads "weizhongwei" [taste within taste], and the Menghai cake is pictured right. The cakes are tight. TIGHT. Good grief, are they tight. I can see those tasked at with compression at Xiaguan raising an eyebrow or two over the uberfusion that has occurred with these bing. They must have used some serious machinery to get these flinty little beasts pressed. The term "iron bing" really isn't strong enough. Below, I have shown the profile of this heavy little discus. Getting leaves out of this cake is not at all easy. I'm a fan of loose compression because I don't like to mangle my leaves. Also, looser compression (and resultant increased movement of air) seems to provide more rapid aging - all of our tightly compression Xiaguan teas are aging much more slowly than their looser peers. Below, evidence of my attempts to get some leaves out of this cake. Patience is the name of the game. I am reminded of the story from Chuangzi, in which the butcher effortlessly passes his knife between muscles and bones, causing meat to fall off with no force. In contrast, I feel as if I am chipping away like an amateur miner. Well, perhaps not quite that bad: I use the very tip of the pu'erdao to edge into the circumference of this disk, and wiggle gently, trying to insinuate my way between strata. Not using force is the key, and to attempt access in many different sites around the edge. Eventually, a section lifts off, as shown above (the dust around the outside is evidence of my initial failed attempts). The resultant chunks I place directly into the rinsed teapot, rather than attempting to separate them into their constituent leaves - hot water will do a much better job, without the possibility of tearing. Eventually, we get to drink some tea! The soup is pure and clean, gratefully-received evidence that I have not torn too many leaves. 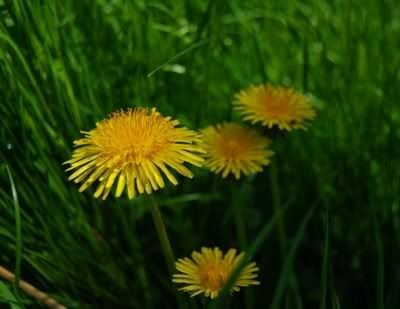 The colour is absolutely yellow, unequivocal and straight, indicating that the 12 Gentlemen have not been knobbling around with the processing. 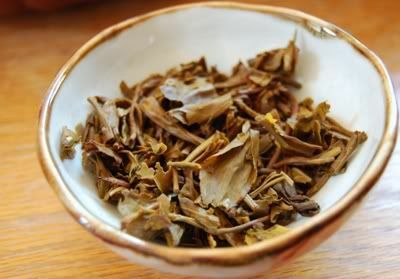 There is a great deal of energy in the mouth, and a superb sweetness packed in with some fine Menghai mushrooms. Vibrant, clean, and impressive. It stays long in the throat, ringing with sweetness. Boatloads of chaqi leave me feeling that the quality of the leaves is fine. The above shot shows the shrivelled remains of some leaves I intended to photograph, but were then abandoned as I went out for a picnic with my dear wife. The 12 Gentry are totally uncompromising: the soup is blindingly yellow, being brutally raw, while the leaves are then further chopped down to size, in the Old School method. There is absolutely no concession to "drink it now". It makes quite a change compared to lots of modern cakes (and I totally adore both modern and traditional young shengpu, as regular readers will know). A tasty bing. Repeated sessions bore similar fruit - tasty tea, and configured for the long haul. "What's that, at the back of my shelf, squatting behind the lapsang?" I thought to myself. 2007 seems like long ago, but it was only six years. How much has changed in the interim! Has the cake changed, too? There is just one portion removed from the cake, evidence that it has remained untouched since I bought it (well, since Norpel bought it for me) some time ago. The leaves look quite dark now, and carry a forthright "plummy" scent that suggests this cake is not in the state in which I left it. 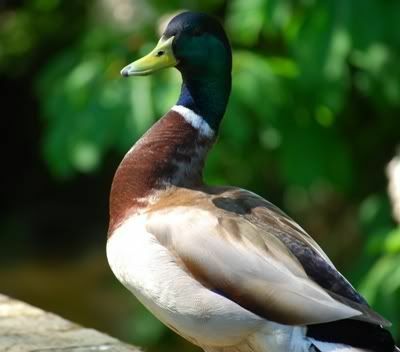 The rinse is a yellow-brown colour, which is certainly different to the dazzling yellow of its early days. 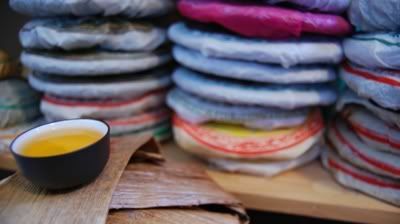 The aroma cup holds a scent that is typical "Menghai": dark, low, and sweet. 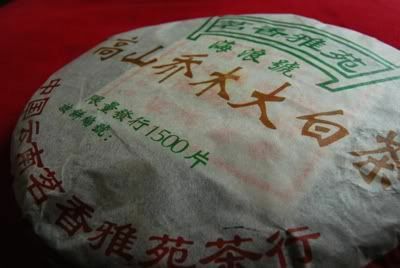 This particular cake's scent is long-lasting and gradually, after so very long, it folds into a brown-sugar lengxiang [cooling scent]. This duration is remarkable. In the intervening years, this cake has changed a great deal - something that is slightly hinted by the change in colour, shown above, to a solid orange. The soup is instantly cooling, testimony to the fact that the leaves are of good quality. The base has settled into a low sweetness, with a rich and humid feeling to it. All the while, the tongue buzzes uncontrollably, especially at the tip of the tongue. It tastes, records my journal, "rather like a fizzy and cooling version of a good Changtai cake from their decent period." Then, something odd happens. It feels as if I have woken this cake from the middle of its pupation: it is at an interim stage where it has not yet attained the woodiness of age, but where it is absolutely different to its original character. The extremely tight compression has not preserved its youth in any way, which is worth noting. While the youthful flavours have settled and deepened, the raw bitterness of its youth remains in quantity - this cake needs more time, but has the contents to become a good aged cake. 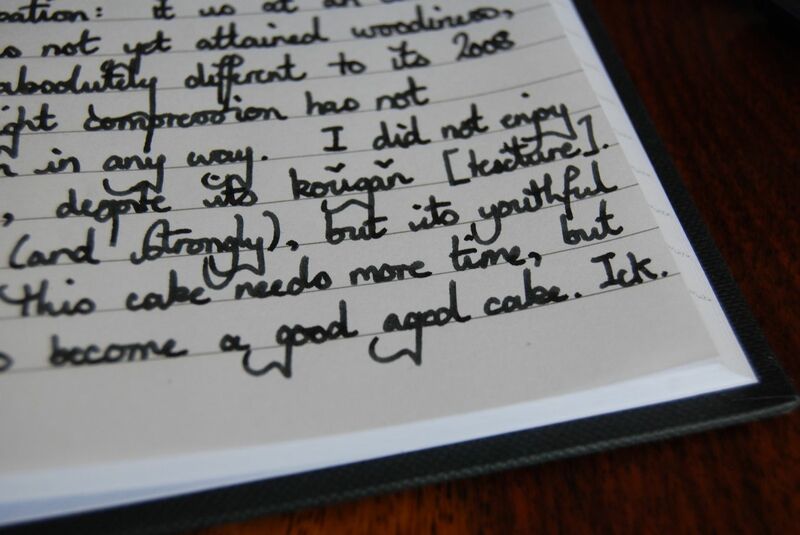 My journal simply records "ick". 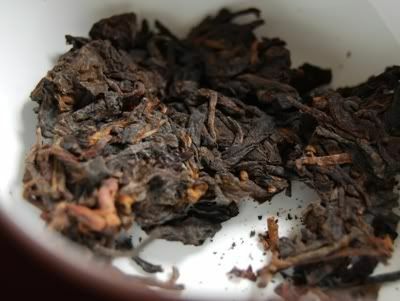 2005 Six Famous Tea Mountains "Yiwu Zhengshan"
2003 Menghai "Dayi Qiaomu Laoshu"